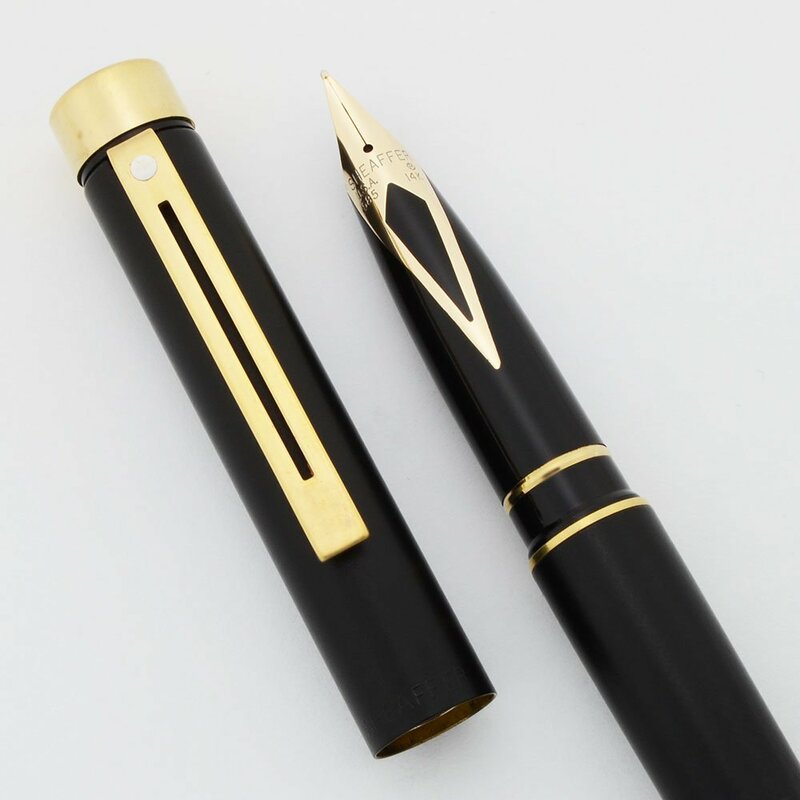 Sheaffer Targa 1003 fountain pen from 1989-98. Matte black finish with gold plated trim and the later gold plated cap derby. Medium 14k gold nib is smooth and springy. Excellent condition, the finish has no scratches but there is some wear to the trim. Product Name Targa -- model 1003, later version with gold plated derby. Manufacturer and Year Sheaffer, made in USA -- 1989-98. Color Matte black with gold plated trim. The trim includes gold plated end pieces. Nib MEDIUM 14k gold nib is smooth with nice tipping material and springy. The section is unmarked so we can't be completely sure of the nib size, but we believe it is a medium. Condition Excellent condition. The black finish looks good but it does have some wear and light scratches, however nothing that penetrates the black layer. There is one spot of plating wear on the cap derby. Light wear and polishing marks on the trim.